Production: Goskino; black and white, 35mm, silent; running time: 73 minutes; length: 1,969 meters. Released 1924. Producer: Boris Mikhine; screenplay: V. Pletniev, I. Kravtchunovsky, Grigori Alexandrov, and Sergei Eisenstein (called the Proletkuit Collective); photography: Edouard Tisse with V. Popov and V. Khvatov; production designer: Vasili Rakhas; assistant directors: G. Alexandrov, A. Levshin, and I. Kravchinovski. Cast: Maxim Straukh ( The Spy ); Grigori Alexandrov ( The Foreman ); Mikhail Gomorov ( The Worker ); I. Ivanov ( Chief of Police ); I. Klyukvine ( The Activist ); A. Antonov ( Member of the strike ); J. Glizer, B. Yourtzev, A. Kouznetzov, V. Ianoukova, V. Ouralsky, M. Mamine, and members of the Proletariat Troup. Eisenstein, Sergei, and others, Stachka , in Iskusstvo Kino (Moscow), November 1981. Eisenstein, Sergei, Film Sense , edited by Jay Leyda, New York, 1942. Rotha, Paul, Ivor Montagu, and John Grierson, Eisenstein, 1898–1948 , London, 1948. Eisenstein, Sergei, Film Form , edited by Jay Leyda, New York, 1949. Sergei Eisenstein—Kunstler der Revolution , Berlin, 1960. Mitry, Jean, S. M. Eisenstein , Paris, 1961. Moussinac, Léon, Sergei Eisenstein , New York, 1970. Barna, Yon, Eisenstein , Bloomington, Indiana, 1973. Fernandez, Dominique, Eisenstein , Paris, 1975. Sudendorf, W., and others, Sergei M. Eisenstein: Materialien zu Leben und Werk , Munich, 1975. Seton, Marie, Sergei M. Eisenstein , London, 1978. Aumont, Jacques, Montage Eisenstein , Paris, 1979; London, 1987. Eisenstein, Sergei M., Immoral Memories: An Autobiography , Boston, 1983. Bordwell, David, The Cinema of Eisenstein , Cambridge, 1993. Goodwin, James, Eisenstein, Cinema, and History , Champaign, 1993. Lovgren, Hakan, editor, Eisenstein's Labyrinth: Aspects of a Cinematic Synthesis of the Arts , Philadelphia, 1996. Taylor, Richard, editor, The Eisenstein Reader, Bloomington, 1998. Bergan, Ronald, Sergei Eisenstein: A Life in Conflict , New York, 1999. Montague, Ivor, "Sergei Eisenstein," in Penguin Film Review (London), September 1948. Montagu, Ivor, "Rediscovery: Strike, " in Sight and Sound (London), Autumn 1956. Knight, Arthur, "Eisenstein and the Mass Epic," in The Liveliest Art , New York, 1957. Cutts, John, in Films and Filming (London), March 1961. Kuiper, John, "Cinematic Expression: A Look at Eisenstein's Silent Montage," in Art Journal , Fall 1962. Yourenev, Rostislav, "Eisenstein," in Anthologie du cinéma , Paris, 1966. "La Greve Issue" of Avant-Scène du Cinéma (Paris), October 1967. New York Times , 15 March 1968. Siegler, R., "Masquage: An Extrapolation of Eisenstein's Theory of Montage-as-Conflict to the Multi-Image Film," in Film Quarterly (Berkeley), Spring 1968. McDonald, Dwight, "Eisenstein, Pudovkin, and Others," in The Emergence of Film Art , edited by Lewis Jacobs, New York, 1969. Kuleshov, Lev, "Kuleshov on Eisenstein," in Film Journal (New York), Fall-Winter 1972. Eisenstein, Sergei, in Skrien (Amsterdam), May-June 1973. Sklovskij, V., in Filmwissenschaftliche Beiträge (East Berlin), no.15, 1974. Crofts, Stephen, "Eisenstein and Ideology," in Framework (Norwich), Spring 1978. Perry, T., "Sergei Eisenstein: A Career in Pictures," in American Film (Washington, DC), January-February 1983. Amengual, Barthélemy, "Ejzenstein-Faure: Rapporto senza dissonanze?" in Cinema Nuovo (Bari), December 1984. Doufour, D., "!Revolutie? (2)," in Film en Televisie + Video (Brussels), vol. 428, January 1993. Doufour, D., "!Revolutie? (3)," in Film en Televisie + Video (Brussels), vol. 430, March 1993. Beller, J., "The Spectatorship of the Proletariat," in Boundary 2 , vol. 22, no. 3, 1995. Virmaux, A., and O. Virmaux, " La greve (1924) d'Eisenstein," in Jeune Cinéma (Paris), vol. 239, September/October 1996. Richardson, Paul E., "The First Master of Russian Film," in Russian Life , vol. 41, no. 2, February 1998. Envisioning a film which would both reflect and embody the essence of Russia's 1917 revolution, the 26-year-old Sergei Eisenstein directed his first feature film, Strike , in 1924. Strike was to have been one of eight projects in a state-sponsored series entitled Towards Dictatorship , with reference to the dictatorship of the proletariat. The focus of the series was intended to be the struggles of the working class which preceded and paved the way for the revolution. Eisenstein's Strike was the only film of this group to be realized. At that time Eisenstein's central aesthetic concerns were the practice of montage and the concept of the mass hero. It is not his political or social intent but, rather, his methods which continue to be of interest. As propaganda the film cannot be termed an unqualified success; it does not arouse passion or provoke protest today as does Leni Riefenstahl's Triumph of the Will , for example. But the impact of Strike 's aesthetic boldness remains undiminished. It is an impact which can be explained in terms of mechanical energy, on both formal and material levels. One function of art is to subordinate man's environment to man, to bring the technical landscape into the realm of human affairs rather than allow it to dominate or intimidate its creators. Eisenstein, in accepting this challenge, depicts the environment of the workers in Strike as part of their lives. The film's opening shot of factory smokestacks sets the tone. Shots of written communications which urge, "Workers of the world, unite," are intercut with shots of machinery in motion. The workers look healthy and at home in the factory amid shining, powerful machines and moving parts; and Edouard Tisse's camera embraces factory as readily as it embraces worker. The human is not oppressed by machinery. On the contrary, the workers enlist the machinery in their struggle against the representatives of capitalism. The machines become weapons. On another level, the machinery serves a musical function; the very conscious internal rhythm of the film is often determined by spinning flywheels or other moving mechanical parts. This Constructivist approach is less notable in the long run than is the more personal aspect of Eisenstein's work in Strike —his use of montage. He described his conception of montage as collision, and it is important to note that the collision of elements in his work never results in a loss of energy. The film as a whole is something of a perpetual motion machine, with each action or movement yielding its force to a subsequent action or movement. One of the most pleasing examples of this principle is contained in the following sequence: a large crowd is seen in long shot making its way through the village; at the instant the crowd passes a liquor store, an explosion occurs and the crowd as a whole turns and veers slightly toward the explosion in a movement as graceful and precise as the movement of the arm of a conductor bringing an orchestra to a sudden halt. The pause is but momentary, and the movement continues in a new direction as the crowd flows toward the camera in the next shot. Most of the forms of montage which Eisenstein elaborated in his books Film Form and The Film Sense can be found in Strike . For example, association montage compares a hand-operated citrus fruit crusher used by the dining businessmen to the rearing horses of the mounted police as they harass a peaceful crowd of strikers. 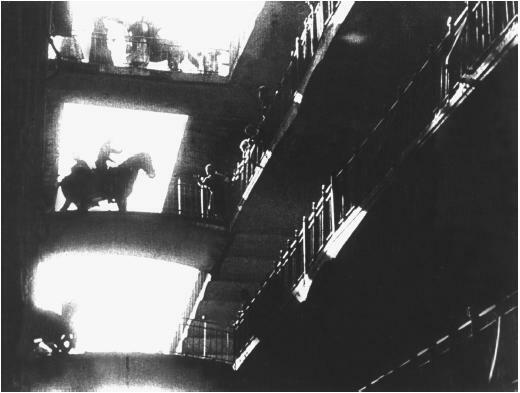 Eisenstein believed that the meaning of a film should arise from the juxtaposition of its elements rather than be continued within those elements. Although the official purpose of his government-sponsored film was to inform the masses, Eisenstein believed that films should not merely carry information but impart sensation and impression. For this reason Strike is meant to inspire action, not reflection. The film never bogs down in its theoretical base. It is perhaps for these reasons that Strike can be distinguished from so-called "bourgeois" films. Not even when a worker commits suicide after being falsely accused of theft does the film pause for any emotion to be displayed. Rather, the worker's suicide note—"Goodbye, remember, I am not guilty"—initiates the strike. It also anticipates the film's conclusion after the slaughter of the strikers—a close shot of a pair of staring, admonishing eyes and the caption "Remember—Proletarians!"